TORONTO - Jon Jones overcame the biggest challenge of his career as he triumphed against Alexander Gustaffson in an epic battle for the Light Heavyweight Championship. Daniel Omielanczuk kicked off the night with an insane knockout in the third round to defeat Nandor Guelmino. The Pole dropped Guelmino right down to the ground with a ferocious left hand. It was pretty much a scramble-fest in the second bout of the night. Although ending in a split decision, there was some scrappy stuff with Alex Caceres defeating Roland Delorme. A little too late for Jesse Ronsen who fell short via Split Decision as he was defeated by Michael Prazeres. Ronsen only got going in the late moments. And to cap off the online prelims, John Makdessi got the knockout victory two minutes into Round 1 to put away Renee Forte. Opening the televised prelims, Mitch Gagnon made quick work of Dustin Kimura with a guillotine choke to submit the Hawaiian just four minutes into Round 1. Stephen Thomson demonstrated his top striking ability with a vicious knockout to Chris Clements. Finally we get to see the strikes at their best. In the penultimate preliminary bout, bantamweights Wilson Reis and Ivan Menjivar fought in a somewhat lackluster fight. Reis tipped it with the Unanimous Decision victory. Opening the main card was the lightweights, as Pat Healy battled the up-and-coming Khabib Nurmagomedov. The fight went the three-round distance, beating Healy convincingly to win the bout. Khabib Nurmagomedov was able to manhandle Healy at times, with some emphatic slams and takedowns crashing to the canvas. There was no better illustration of how the fight went than with the Russian dominating on top as the fight came to an end with the horn. Call him opportunistic, as he called for a title shot in his interview with Joe Rogan after the bout. It was probably the most one-sided fight of the card (at that point) when Francis Carmont and Costa Philippou took to the Octagon where one streak would end. And we soon knew who would continue their win streak, as Francis Carmont just outpowered Philippou, taking him to the ground and exhausting him early on with the ground and pound. Around 75% of the whole fight was spent with Carmont on top position, aggressively depicting Philippou - who had no answer. Phillipou's undefeated streak came to an end in a really frustrating way. 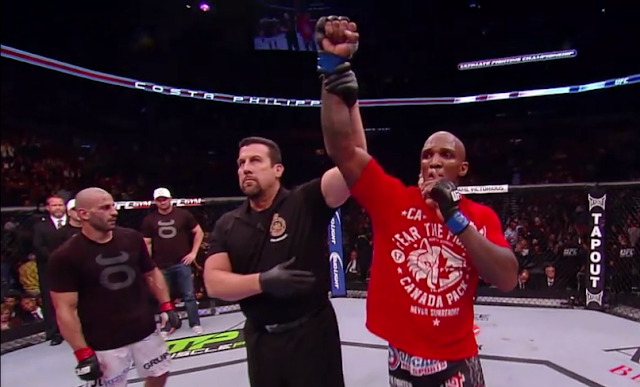 Carmont showed his power throughout, effortlessly taking down Philippou. Just dominant, that's all. Heavyweights Brendan Schaub and Matt Mitrione looked to settle their rivlary within the confines of the Octagon. Both men initially were in search of the knockout, although there was a drastic change in pace after. Schaub then landed a combination before the takedown, managing to get in a tight d'Arce choke. Mitrione signalolled a thumbs up to the referee at first, but Schaub had it so tight that MItrione was out unconscious. Superb submission. In one of two title bouts on the night, Renan Barao defended his Interim Bantamweight Championship against Eddie Wineland. Wineland looked to be edging the first round, landing the more strikes and keeping Barao restricted. However, Barao got into it in the latter stages, and picked up where he left off. Just thirty-five seconds into Round 2, Renan Barao knocked out Wineland with a spinning back-kick to the face. Eddie Wineland went down and it only took a few strikes for the referee to end the fight. Surely this sets up for Cruz vs. Barao now? What a knockout by Barao. In the main event, Jon Jones put his Light Heavyweight Championship on the line against Alexander Gustaffson. The challenger was off to a great start as he cut just above Jones' eye and then later in the round got the takedown on Jones for the first time in his UFC career. In the second, it was more entertaining stuff, Gustaffson caught the kicks and defended Jones' takedown. Two great rounds got things underway, with Gustaffson showing he was well in the fight. Jones landed his shots, too. In Round 3, Jon Jones was throwing some good kicks and had Gustaffson breathing heavily after kicks to the body. Gustaffson and Jones continued to throw shots at each other in an entertaining battle. With two swollen eyes, a big cut and Gustaffson looking confident, it looked like Gustaffson had the lead on the scorecards as we approached the Championship rounds. Then came Round 4, and what an epic round it was. Absolutely incredible stuff! Jones hit Gustaffson with some nasty elbows, but the Mauler continued to eat shots and powered forward! Round 5, the guys went at it. Exhausted, but they fought right until the end. What an epic fight. Jon Jones retained his title on the judges scorecard. But what an amazing fight. John Makdessi's quick knockout off Renee Forte should definitely get him on the television broadcasts from now on. Billed to be the best fights on the undercard, Ivan Menjivar vs. Wilson Reis and Myles Jury vs. Mike Ricci seemed to be underwhelming. Expected better, but with the main card in sight, things were not all bad..
Khabib Nurmagedov defeated the veteran Pat "Bam Bam" Healy to open the main card. It was by far a convincing win to make his mark on the division, and already has title hopes in his sights. We'll have to wait and see for that one. Costa Phillipou was just exhausted and frustrated ever since the halfway point of the first round. He really had no answer from Carmont's aggressive onslaught and his lack of communication with his corner showed it all. It has been some time since a fighter has been put to sleep from a submission, but tonight, Brendan Schaub achieved this against Matt Mitrione. Renan Barao defended his title in emphatic fashion with a spinning back-kick knockout to the face. Dana White said earlier in the night that Dominick Cruz would fight the winner for unification of the belt, so are we set for Cruz vs. Barao. Renan Barao's spinning back-kick surely was knockout of the night. It was the first ever spinning back-kick knockout to the face in the UFC. Jones and Gustafsson gave it their all in this epic fight. Alexander Gustaffson just ate shots, and Jones continued to work in an amazing fight. These may be all but official, looking like they will happen in the next fights with these men. Renan Barao in a title unification bout against Dominick Cruz, and Jon Jones to battle Glover Teixeira? Jon Jones joins Anderson Silva, Georges St-Pierre, and Royce Gracie as the only fighters in UFC history to earn ten consecutive wins. Picking the bonuses for UFC 165 is easy tonight, these are the best by far. Just an amazing fight! That's how title fights should be! Fight of the night? How about fight of the year. Another fantastic UFC PPV. Jon Jones and Alexander Gustaffson had an epic fight, Renan Barao retained his title and it was just a night of real good fights. Jon Jones now joins an elite class of fighters to have a six-fight and over title reign with his hard-fought win over Alexander Gustaffson. An epic encounter ends with Jon Jones keeping his Light Heavyweight title reign alive. It was a battle for the ages in Toronto, Canada, and still Light Heavyweight Champion, Jon Jones. Full coverage, reports, breakdown and more information for UFC 165. This MMA event was broadcast LIVE on PPV from Toronto, Canada.